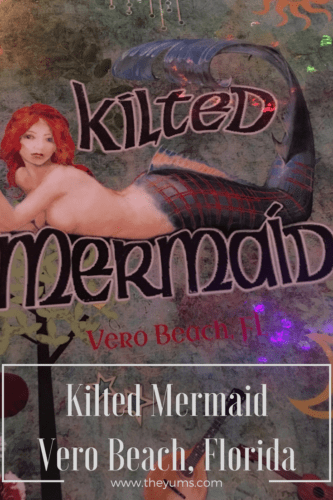 Kilted Mermaid in [easyazon_link identifier=”0692819258″ locale=”US” tag=”theyum-20″]Vero Beach[/easyazon_link], Florida, is first-rate experiential dining with choices that will lead you out of your dining comfort zone and wanting more. The chill vibe immediately envelopes you. A funky and fun atmosphere, reminiscent of the 1970s permeates this Vero Beach eatery. Mermaids of all sorts, flowers and miniature lights add to the eclectic and funky atmosphere. Menu: Kilted Mermaid’s menu is an eclectic mix of small plates, salads and sandwiches, and larger plates and cheese and dessert fondues. Their drink menu features a selection of 25+ local and global wines as well as a choice of over 80 craft and [easyazon_link identifier=”0060796111″ locale=”US” tag=”theyum-20″]imported beers[/easyazon_link]. Thoughts: When you dine at Kilted Mermaid, it is an adventure in adventurous dining. On our recent visit, we stepped outside the box, ordering an artisan cheese platter featuring brie cheese and olive infused bread, and the artichoke and fresh spinach fondue. The artisan cheese plate was a beautiful beginning to our relaxed evening. It was fresh, creamy mushroom brie, which complemented the olive infused bread slices well. The star of the evening was the artichoke and spinach fondue! Sheer culinary enjoyment as we leisurely dipped and ate our way through the selection of chicken, beef, bread cubes and veggies. Lingering over our second glass of wine, we pondered what to choose next. Our server wisely suggested a salad for our last course. When our Kilted Salads arrived, we were pleasantly surprised. The [easyazon_link identifier=”B00DE4I5CE” locale=”US” tag=”theyum-20″]macadamia nuts[/easyazon_link], [easyazon_link identifier=”B000H7LVKY” locale=”US” tag=”theyum-20″]dried cherries[/easyazon_link], goat cheese and fresh baby greens blended well with the home-made [easyazon_link identifier=”B00HOSIMV0″ locale=”US” tag=”theyum-20″]balsamic honey dijon vinaigrette[/easyazon_link] to create a delicate flavor burst in our mouths. What a delicious treat! Kilted Mermaid is a laid-back, neighborhood beer and wine bar, and the staff is glad to help you choose a drink outside of your standard drinking zone. We are fans of [easyazon_link identifier=”B014GCD27A” locale=”US” tag=”theyum-20″]pinot noir[/easyazon_link]. However, our server encouraged us to step outside our norm and order a [easyazon_link identifier=”B01DQ122D2″ locale=”US” tag=”theyum-20″]merlot[/easyazon_link], which complemented our meal quite well. Every Wednesday evening, beginning at 8:30 pm is Open Mic night. Offering a variety of musical styles, this is an entertaining evening. It’s an opportunity to come and hang out with music lovers, linger over good wine, and hear some great local talent. On Thursdays, they offer a Trivia night, which is a bit rowdier, but a lot of fun and a lot of laughter. Favorite Dishes: Fondue, hands down! I love the concept of communal meals, and the fondue at Kilted Mermaid is some of the best we have shared. With options ranging from the classic Swiss Fondue to the creative Spicy Sausage, there is an option for everyone. Another standout dish is their truffle mac and cheese, created with Cacciota al Tartufo (a black truffle infused semi-soft cheese made with pasteurized cow’s milk and sheep’s milk), [easyazon_link identifier=”B005SU6Q5U” locale=”US” tag=”theyum-20″]Asiago[/easyazon_link], shallots and a bit of sherry. This dish is rich, creamy and absolutely exquisite! Price Range: Small plates are $5 to $14, with the tuna crudo wontons and duck empanadas at the high end of the scale. The Medium plates are all priced at $12. Larger plates range from $18 to $22. All are meant to be shareable portions. Salads and sandwiches range from $9 to $15 and are shareable portions. Fondue options are priced in the $13 to $14 range. The fondues are designed to be shared by two persons, but can easily be divided by four as an appetizer. For hotels in the Vero Beach area, you’ll find recommendations here. Disclosure: This post contains affiliate links. Clicking through for additional information or to make a purchase may result in a small commission being paid at no cost to you. By doing so, you help support this site and its authors, and we thank you.